Arkansas Territory was rugged with few roads and little civilization when U.S. President James Monroe appointed war-hero James Miller to the governorship in 1819. The Territory was not a coveted prize. The region was located on the far edge of the U.S., was not well developed and had swamplands that prevented easy travel. Published journals by authors, including Henry Schoolcraft, were filled with tales of wild mountain men who lived off the land. Even so, the U.S. Congress formed the Arkansas Territory, which then needed a leader. Miller was a well-known, highly respected and successful politician. He was born in New Hampshire in 1776. He rose through the military ranks as a young man and commanded the 21st U.S. Infantry by the War of 1812. During the Battle of Lundy’s Lane in Niagara, Ontario, Miller’s commander ordered him to seize British artillery, which was hammering the American forces. Miller replied, “I’ll try, sir,” then successfully completed the mission. The phrase became a symbol of Miller’s pluck and determination. Miller’s successful military career led him into politics and put him in a position to be considered for the new Arkansas Territory’s governorship. But, Miller was not the only candidate for the position. Congressman George Robertson of Kentucky was a contender and was the most likely choice because he had guided the bill that created the Territory. When Robertson declined to pursue the position, Miller became the leading candidate. 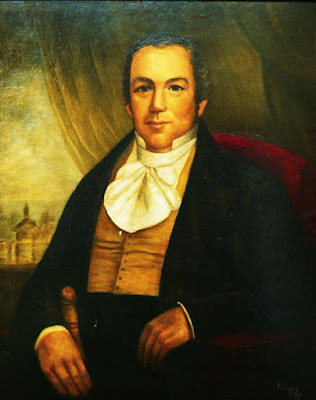 On March 3, President Monroe commissioned Miller as the first territorial governor. Monroe also appointed Robert Crittenden, a 22-year-old Kentuckian, to serve as territorial secretary. The secretary position was akin to the current position of Lt. Governor. By June, governmental appointees began arriving in Arkansas Territory, but Miller had not even begun traveling to Arkansas. The March appointment had been mistakenly delivered to Arkansas Post instead of to Miller’s New Hampshire home. The mistake was not discovered until the end of May. Miller wrote June 1 to U.S. Secretary of State John Quincy Adams and asked for permission to delay his departure until September. Miller wanted to make sure his family would be cared for during his absence and wanted to collect weapons and ammunition to arm a territorial militia. Adams agreed. Miller’s delay left a political vacuum that Crittenden quickly filled. The territorial secretary began organizing the government, making appointments and approving expenditures. Miller set out from Pittsburgh, Pennsylvania, to Arkansas aboard the barge named Arkansaw. He took a meandering route and stopped at towns where locals cheered the Hero of Lundy’s Lane and Veterans of the War of 1812. People traveled to towns to shake the American hero’s hand and often honored Miller with a toast. People used the phrase “I’ll try, sir,” to honor him. Because of Crittenden’s hard work, the territorial government was functioning when Miller arrived. Miller presided over the first legislative session, which included approving Crittenden’s appointees. He also undertook moving the territory’s capitol to Little Rock. At the beginning of the legislative proceedings Feb. 10, 1820, Miller spent most of his time apologizing for his late arrival. “(T)he subjects, which will require your particular attention during the present session, must be better understood by you than by myself being as yet almost a stranger,” he said. Miller remained territorial governor until 1824, when he became collector of customs in Salem, Massachusetts. He held that position until 1849. Arkansas’s sixth county, Miller County, was formed in 1820 and is named after the first territorial governor. Miller died in 1851. Crittenden stayed in the Territory and was an important political figure for several years. Arkansas’s 12th county, formed in 1825, is named after Crittenden. In 1834, he was arguing a case in Vicksburg, Mississippi, when he collapsed and died at the young age of 37. For more information about Arkansas Territory, Miller or Crittenden visit the Arkansas State Archives at http://archives.arkansas.gov.